The TED Talks lecture series is a wonderful intellectual and cultural resource. I’ve been a fan for years and on this long weekend relished the opportunity to catch up on some I’ve had in my queue. One of my favorites is by Ken Robinson, because it highlights both a goal and a challenge of my research. Education, to many, is a very dry topic. That’s because, for many, the practice of education is very dry. If you ask a space alien what education is for, he posits, they’ll say it’s training to be a university professor. That’s the pinnacle of the process, right? But it takes much more than university professors to make the world go round, of course. How can our system of education support the diversity of needs and foster the diversity of talents of a rich and dynamic society? That’s the goal. I ask “how” not “if” because I don’t see it as a choice. Globalization, mechanization, intelligent machines… these demand that we develop human resources, fostering the gifts of each person however they may manifest. Motivated by the example of Gillian Lynne (starting 2:30 in the talk), Robinson argues that we increase the amount of education in the arts, even specifically teaching dance to everyone. Such sentiments underestimate the constraints on time, money and attention for and of students. I would imagine Robinson is not a fan of intelligent tutoring systems, how they involve sitting at a desk and developing, most often, a laser focused set of skills. But I think research in intelligent tutoring systems and other computer supported learning can help address the diversity he speaks of and even help students learn to dance, if that’s something a community values. Firstly, they can help increase the efficiency with which “maths” (he’s British) and other “left brain” skills are learned, leaving more time for other enrichment. Secondly, and this is a goal of my research, computers can help personalize instruction to each student’s needs and interests. The computer can devote its unblinking attention to the individual, drawing on a wealth of data about their prior interactions with the system, and that of other learners like them, to deliver an effective and engaging learning experience. Technology isn’t the answer, but it is part of the best solution. Thanks for reading. I encourage you to watch the whole talk as it has many more gems than I’ve noted here, and several laugh out loud moments. This entry was posted in curriculum, research on November 29, 2009 by Turadg. Anyone who publishes in conferences knows the pain of making sacrifices to meet a deadline, only to find at the last moment that it has been extended. Year after year of these extensions and people come to expect them, making them all the more inevitable. This reminds me of people who set their clocks fast to be late less, only to adjust themselves again to be late and have to move their clocks ever earlier. At what point do conference deadlines lose their credibility? I’d be interested to know how many people believe a conference’s deadline, as an effect of how often that conference extends its deadlines. I imagine that younger researcher are more credulous, but that it’s simply because they lack the knowledge of all the extensions. I hope this helps. I just added AERA, which had been due today. This entry was posted in research on July 15, 2009 by Turadg. If you’ve been to an plenary session or keynote on education research chances are you’ve heard of Pasteur’s Quadrant. It’s the idea that basic science (e.g., Bohr) and applied science (e.g., Edison) can be brought together to have significant impact on society, as exemplified in Pasteur’s prodigious contributions. Which quadrant should education research target? Pasteur’s Quadrant was articulated (and I believe originated) in the book of the same name by Donald Stokes in 1997. Stokes was a professor of politics and public affairs and argued for use-inspired basic research as an important target of public funds. My interest is more in research than public policy and I haven’t read the book. If you’re interested, but the publisher’s summary gives a good summary of the public policy thesis and the transitions in government research funding that it spoke to. One way of making this distinction is in the terms introduced in the infrequently read but oft cited 1997 book by Stokes, called Pasteur’s Quadrant – Basic Science and Technological Innovation. Stokes described three categories of research based on two binary dimensions: first, a quest for fundamental understanding, and second, a consideration of use. The work of the theoretical physicist, Niels Bohr, exemplifies the quadrant in which researchers search for fundamental knowledge, with little concern for application. The research of Louis Pasteur, whose studies of bacteriology were carried out at the behest of the French wine industry, characterizes the work of scientists who, like Bohr, search for fundamental knowledge, but unlike Bohr, select their questions and methods based on potential relevance to real world problems. The work of Thomas Edison, whose practical inventions define the 20th century, exemplifies the work of scientists whose stock and trade is problem solution. They cannibalize whatever basic and craft knowledge is available, and conduct fundamental research when necessary, with choices of action and investment driven by the goal of solving the problem at hand as quickly and efficiently as possible. Each of the scientific quadrants identified by Stokes is important to the common good. Those who argue for the value of basic research have no trouble finding examples of work inspired only by intellectual curiosity that turned out to be extremely practical. Bohrs’ work on quantum physics is a case in point. 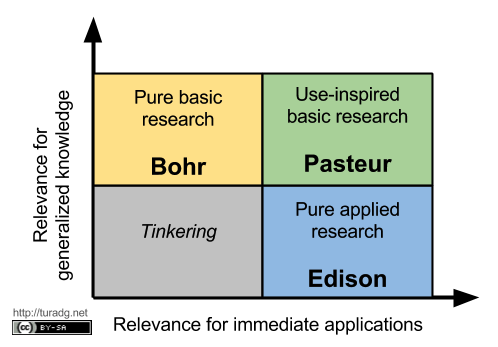 Without in any way diminishing the value of basic research, whether use-inspired or not, I want to argue for the importance of activities in Edison’s quadrant, particularly for topics in which there is a large distance between what the world needs and what realistically can be expected to flow from basic research, and for topics in which problem solutions are richly multivariate and contextual. Education is such an area: a field in which there is a gulf between the bench and the trench, and in which the trench is complicated by many players, settings, and circumstances. Choose what you consider to be the most exciting developments from basic research in Bohrs’ or Pasteur’s quadrants that are relevant to education. I’ll pick developments in cognitive neuroscience. Paint the rosiest scenario you dare for basic scientific progress in the topic you’ve chosen over the next 15 years. Then ask yourself what would need to be done to translate those imagined findings into applications that would have wide and powerful effects on education outcomes. I don’t know about you, but I’m not optimistic that the results of basic research, even if the findings are powerful, will flow directly and naturally into education. Goodness! Education hasn’t even incorporated into instruction what we know from basic research about the effects of massed versus distributed practice – and I learned about that in a psychology course I took in 1962. Yes, the world needs basic research in disciplines related to education, such as economics, psychology, and management. But education won’t be transformed by applications of research until someone engineers systems and approaches and packages that work in the settings in which they will be deployed. For my example of massed versus distributed practice, we need curricula that administrators will select and that teachers will follow that distributes and sequences content appropriately. Likewise, for other existing knowledge or new breakthroughs, we need effective delivery systems. The model that Edison provides of an invention factory that moves from inspiration through lab research to trials of effectiveness to promotion and finally to distribution and product support is particularly applicable to education. In summary, the Institute’s statutory mission, as well as the conceptual model I’ve just outlined, points the Institute toward applied research, Edison’s quadrant. I’ve labeled this chart, “Edison’s quadrant, mostly,” because I understand that it is important to nurture the development of basic knowledge related to education, particularly in areas in which other science agencies and major foundation’s aren’t involved. Thus, when resources permit, the Institute will support work that examines underlying process and mechanisms, and work that is initiated by the field. For instance, the President’s budget request for the Institute for fiscal year 04 includes a healthy amount of money for a field-initiated competition. In addition, many of our new funding programs that are squarely focused on application, such as our program in preschool curriculum evaluation, provide for grantees to carry out parallel research that examines underlying processes. This entry was posted in research and tagged ies, nclb, research on January 18, 2009 by Turadg.